The first photo is a comparison of purpurea and iodantha. The second photo is iodantha. This is one of my earlier introductions. The very first flowers were small and I was disappointed but as it continues blooming you end up with a lovely thick head of cerise flowers. 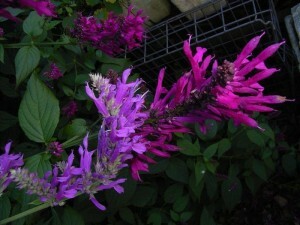 It flowers for months and is very showy, starting in autumn. This salvia can get very tall, 3m or more, if it has a tree to climb through otherwise it could stay down near the 2m or less mark. It is very easy going, taking either sun or shade but will frost burn under –2C. It grows rapidly but is inclined to be brittle so maybe not so good for a windy spot. It is easy to grow from cuttings from thinner wood. It looks pretty much the same as purpurea and flowers at the same time, although purpurea has greyish foliage when young, and flowers are jacaranda mauve. I saw lots of iodantha flowering in the mountains in western central Mexico and asked how can you be sure none is purpurea since they are so close but was told that purpurea grows at a different altitude. 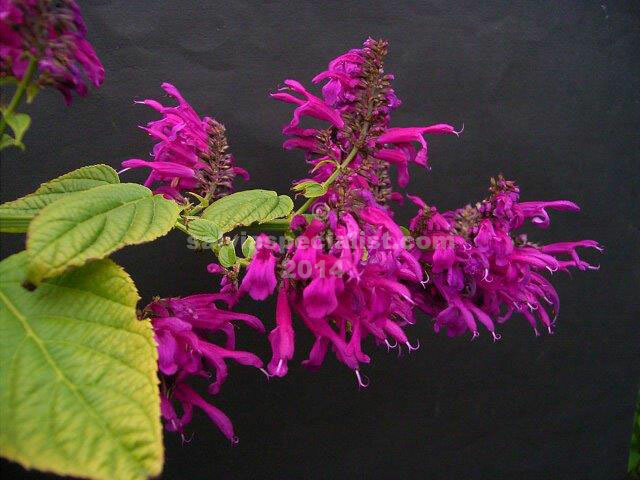 Iodantha seemed to be fairly consistent in flower colour but purpurea seems to vary more. One or two purpurea in stock.